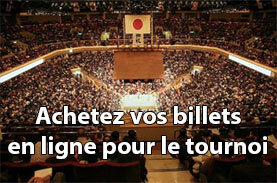 Accueil » Tournois » Tournoi d'Osaka : Haru basho » J13 – Qui peut arrêter Hakuho? 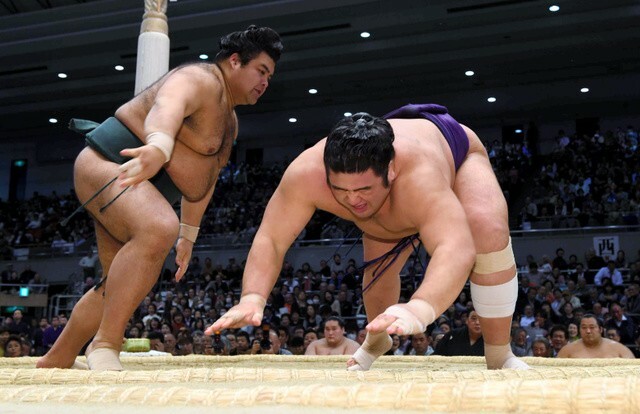 Goeido a battu sans difficulté Terunofuji et reste une victoire derrière le yokozuna Hakuho. 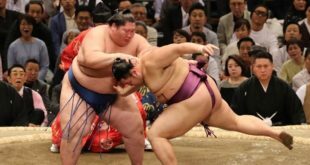 Hakuho a fait un pas de plus vers un 36ème titre suite à sa victoire sans concession contre son compatriote Kakuryu. 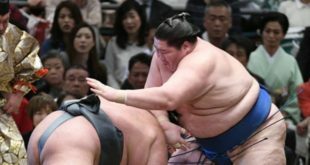 Hakuho n’a laissé aucun espoir à Kakuryu dans l’avant dernier combat de la journée en le sortant sans ménagement. 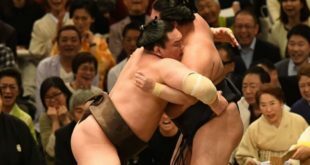 Dès le tachiai, Hakuho a écrasé le visage de son adversaire avant de l’encercler de ses bras et de le conduire hors de l’anneau en quelques instants. 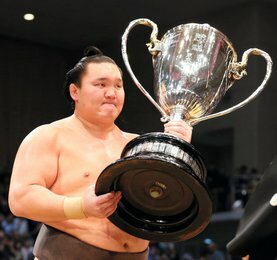 Hakuho reste en tête de la division avec une seule défaite juste devant les ôzeki Kisenosato et Goeido qui se maintiennent avec 11 victoires. Kisenosato était très mobile dans son combat contre Aoiyama et a pu obtenir une prise en mettant ses deux mains sur la ceinture du bulgare avant de le pousser vers sa huitième défaite. Le natif d’Osaka Goeido, impressionne depuis le début de ce tournoi. Celui qui avait besoin de huit victoires pour échapper à une rétrogradation a su réjouir ses supporters en dominant l’ôzeki Terunofuji en ne déployant que peu d’efforts. Terunofuji, qui revient de blessures, a eu beaucoup de peine à atteindre hier sa huitième victoire. Dans le dernier match de la journée, le yokozuna Harumafuji a projeté à terre le vainqueur du tournoi de janvier Kotoshogiku. Dans les rangs inférieurs, Myogiryu avait jusqu’à lors ses espoirs de titre mais il a été vaincu par le maegashira 13 Mitakeumi. L’ancien sekiwake est troisième du classement actuel avec 10 victoires. Le jeune Mitakeumi est parvenu aujourd’hui à obtenir le kachi koshi. Le maegashira 4 Ikioi a atteint sa dixième victoire en chargeant avec force contre Gagamaru ; le géorgien est make koshi. Kotoyuki arrive lui aussi à un résultat de 10-3 après avoir vaincu le komusibi Takarafuji par oshidashi. 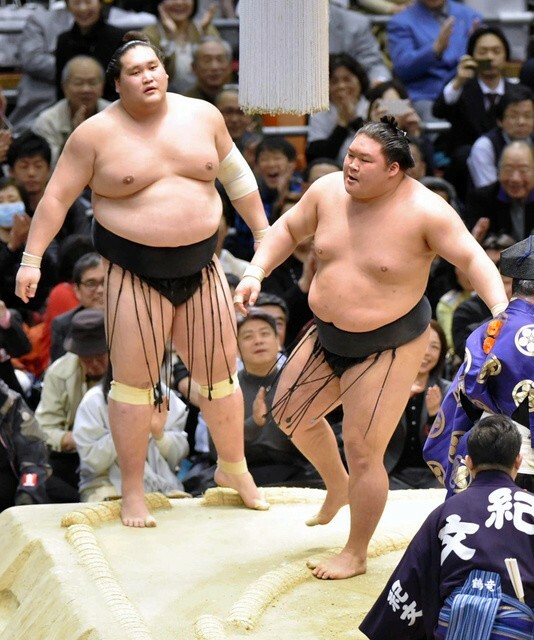 Hakuho closed in on a record-extending 36th career championship title with a controlling win over fellow Mongolian grand champion Kakuryu at the Spring Grand Sumo Tournament on Friday. Hakuho never gave Kakuryu (8-5) a hope in the day’s penultimate bout at Edion Arena Osaka, following up an opening smash to the face with a bear hug and marching him out to stay one win clear heading in the final weekend of the 15-day basho. 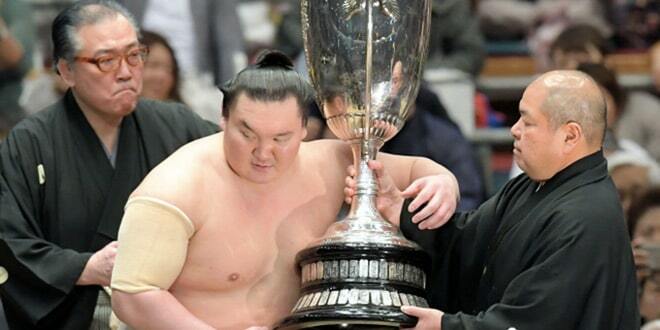 Hakuho improved to 12-1, while ozeki pair Kisenosato and Goeido kept up the chase with 11th wins. Kisenosato was all business in his bout against Aoiyama, getting both hands on the Bulgarian-born No. 3 maegashira’s belt and plowing him out to an eighth defeat. 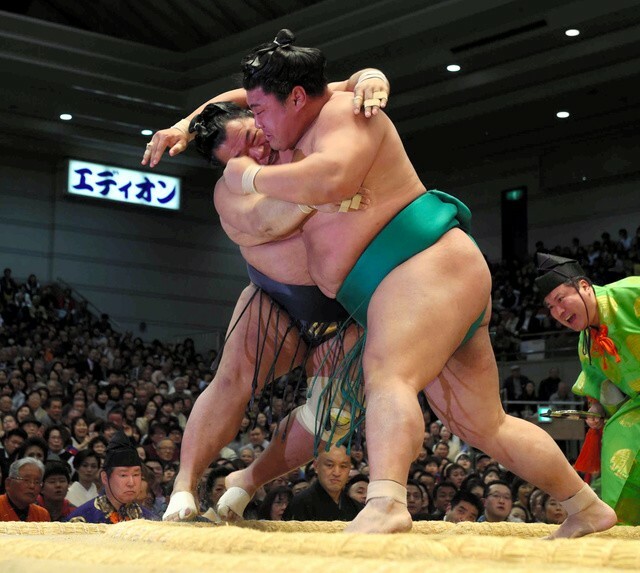 Osaka native Goeido, who has impressed after coming into the tournament needing eight wins to avoid demotion from sumo’s second-highest rank, gave his home fans plenty to cheer about as he dispatched Mongolian ozeki Terunofuji with minimal fuss. 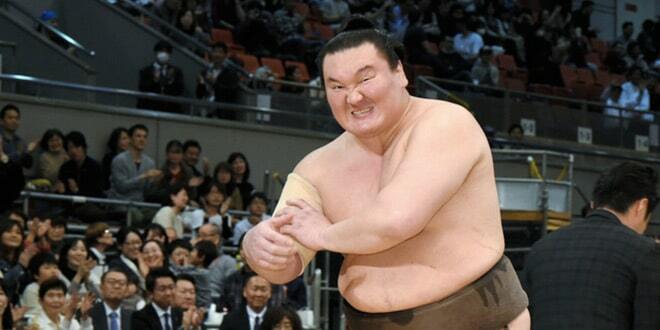 Terunofuji, who also started the meet with his rank on the line, dropped to 8-5. 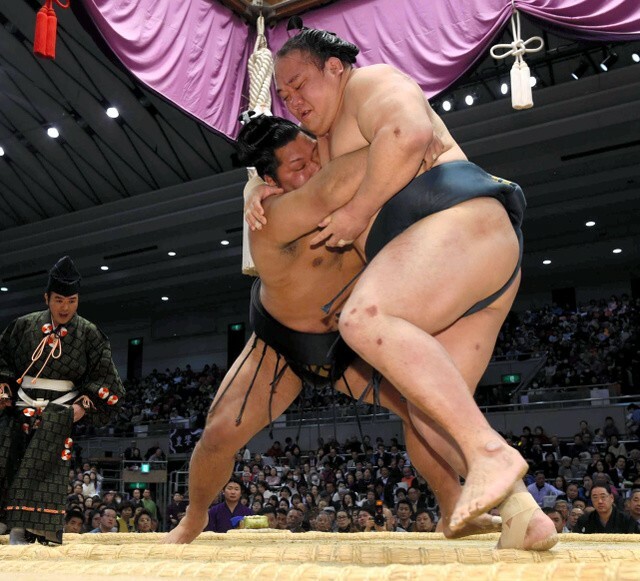 In the day’s last match-up, Mongolian yokozuna Harumafuji (9-4) tossed down New Year champion Kotoshogiku, who slumped to a fifth defeat. Elsewhere, sixth-ranked Myogiryu (10-3) had his title hopes hit as 13th-ranked Mitakeumi turned the tables on the former sekiwake and barged him over the straw ridge for an eighth victory and a winning record. Osaka-born No. 4 maegashira Ikioi moved into double-digit wins with a well-worked force out win against Gagamaru, sentencing the Georgian-born No. 10 maegashira out to a 5-8 losing record in the process. Yoshikaze claimed sekiwake bragging rights against Toyonoshima, prevailing in a slugfest to pick up only his third win of the tournament. Toyonoshima also has a disappointing 3-10 record.